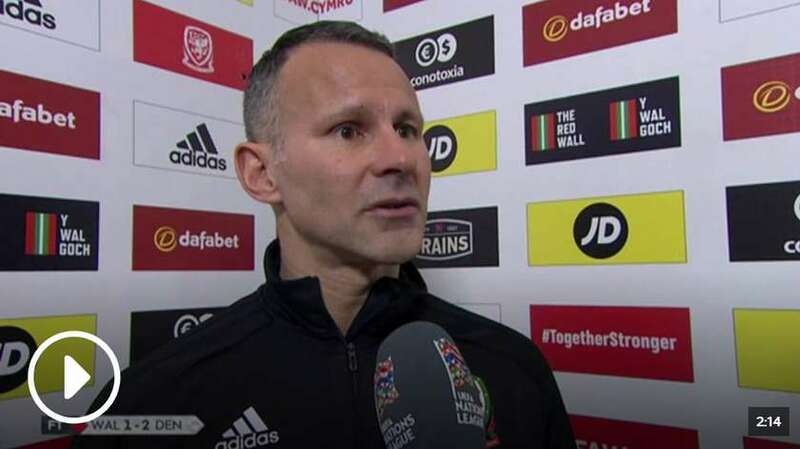 Ryan Giggs believes Wales could learn from Denmark's "discipline" after his side's 2-1 UEFA Nations League defeat at the Cardiff City Stadium on Friday. The victory secured Denmark their promotion to the top tier of the Nations League, but it was their discipline and clinical touch which impressed Wales manager Giggs most. Wales had more shots than their visitors over the 90 minutes, but were undone by two moments of quality and frustrated by a stubborn Denmark defence, bar Gareth Bale's 89th-minute consolation. "But we need to learn the other side, the discipline that Denmark are so good at. But they've been together a long time. "They don't give away many goals, so when they go a goal up very rarely do they give away the game, and they're disciplined. "Up until [they scored] it was even, we had a few headers go beyond the post and a couple of injuries." The defeat marked Wales' last game of the first-ever Nations League tournament, and ended with them remaining in the second tier with six points from four games. And Giggs declared himself happy with their first foray into the competition, saying: "They've been good games, the two wins against Ireland were the highlights, they were very different games, amd Denmark, who started off favourites, rightly so with their quality. I've enjoyed it. "It's gone right to the last game, unfortunately we didn't [win promotion], but we'll dust ourselves down and we've got a big game on Tuesday in Albania."